The 16th Ohio Volunteer Infantry played an integral part in the advance on, occupation and defense of the Cumberland Gap, when Union forces first took possession of the Gap from the Confederates in the summer of 1862. The 16th OVI’s colonel, John DeCourcy, was also made leader of the 26th Brigade, which included the 16th and 42nd OVIs and the 22nd Kentucky Volunteers, along with some artillery units. DeCourcy lead the brigade through nearly impossible obstacles, crossing the Cumberland Mountains at Roger’s Gap, and was the brigade that first occupied the Gap, just three hours after the Rebels fled. Due to a rather brilliant plan of illusion, Gen. Morgan and DeCourcy performed various maneuvers from the time they left Cumberland Ford, effectively fooling the Rebels into thinking the Union force was much larger than it really was. Thus, when DeCourcy approached the Gap, the Rebels chose to abandon allowing DeCourcy and the rest of General Morgan’s division to simply march in and occupy it on June 18, 1862. This letter was written by Private Franklin Mangle of Company G, 16th Ohio Volunteer Infantry. He was 19 years old when he enlisted. He contracted typhus fever and died on 4 March 1863 at Young’s Point, Louisiana. Also serving in the same company were David K. Mangle (1835-1928), and Henry Mangle (1839-?) who were probably older brothers. All three of them appear to have been born in Maryland, probably the children of German immigrants. 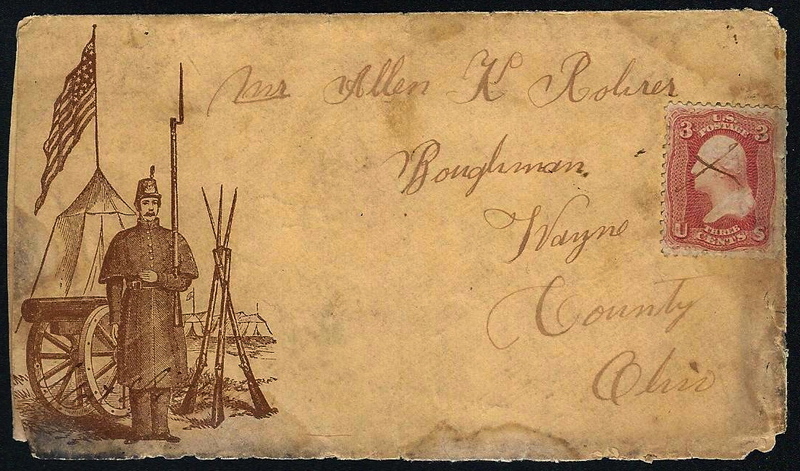 Franklin wrote the letter to his friend from Wayne County, Allen K. Rohrer (1845-1864), the son of Benjamin Rohrer (1821-1909) and Sarah McFarland (1826-1916). 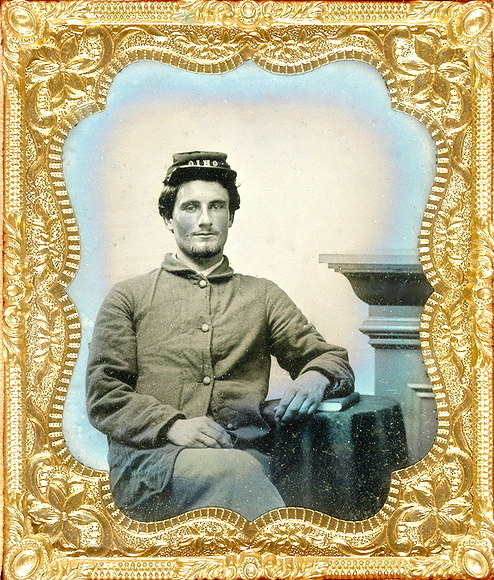 Allen would later enlist in Company E, 169th Ohio Volunteer Infantry in May 1864 and die while garrisoned at Fort Ethan Allen, Virginia on 6 August 1864. It is with great pleasure that I seat myself down to let you know that I am well at present and I hope that these few lines will shortly reach you and find you in good health. I thought I would write you a few lines to let you know where we are and what we are a doing. We are at Cumberland Ford, fourteen miles from Cumberland Gap where there is a mess of Rebels. We have been try[ing] to rout them but they are in too good [a] place. We have got reinforce[ments] yesterday — four thousand [men] and 7 guns, which will [make] 13 guns — and I think we will make the attack in a few days. We drill three times a day. In the morning we drill in the manual of arms, and at half past 10 we drill skirmishing. And in the afternoon we have battalion drill. 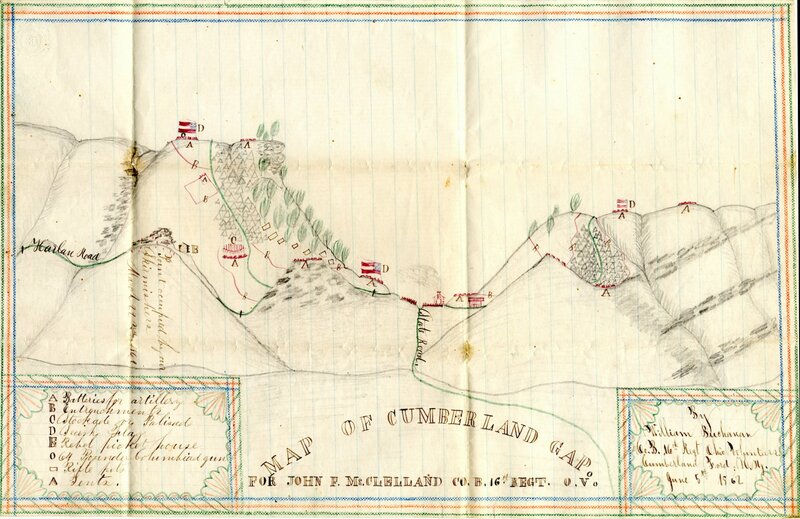 This drawing of the Confederate Forces entrenched at the Cumberland Gap is looking toward the southeast. At this time, the 16th Ohio was camped at the Moss House just south of Cumberland Ford (now Pineville, Kentucky).